Well a little! 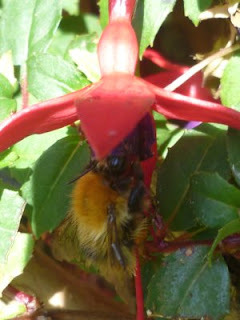 But this one does have a bee attacking it! More shuttles and the new line of "hooks with hats" are going into Jane's Etsy shop later on today. A zebrano shuttle to wet your appetite. I have another tatting idea which I am going to try this week, so keep your fingers crossed! I am pleased to announce that the winner of the giveaway is Singtatter, please could you e.mail me on popabobbinshuttle@gmail.com with your address, and many congratulations - your luck is obviously in! It is a bit of a coincidence as the items will be going to Singapore, a place I am visiting this year. Today is Mothering Sunday which is a movable date in the UK as it is always on the fourth Sunday of Lent. 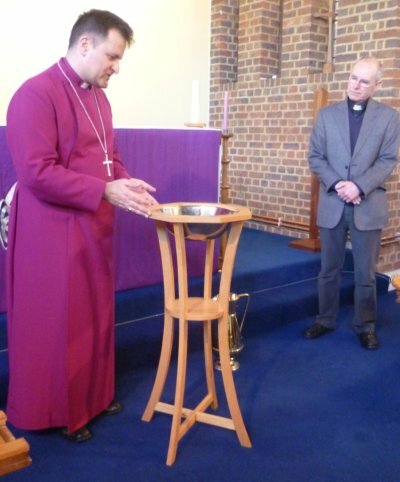 Today the new window was dedicated in one of the churches. The church dates from the 11th century but the window is very modern, nevertheless it does not look out of place. It was designed and made by a very talented lady. 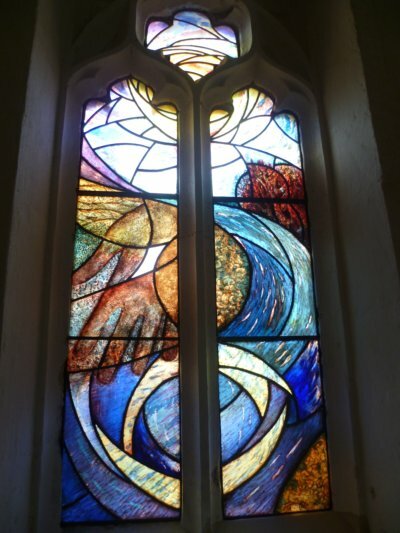 There is a great deal of symbolism in the window which is dedicated to a former parishioner. 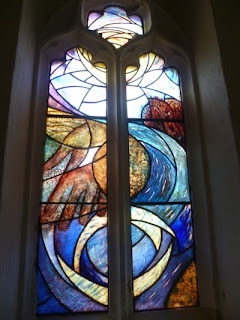 The hand you see in the window was inspired by a hand that is seen in the plaster of the door way into the church. The imprint of a hand has been there for hundreds of years and is called "the hand of God". 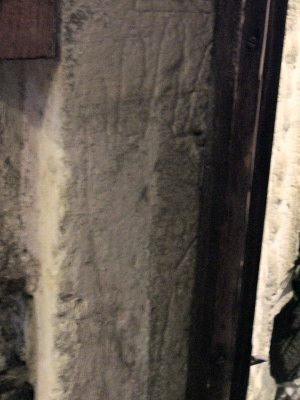 Parishioners used to put their hand on it either when entering or leaving the church. Also the font that "Im in the garage" made was dedicated by the Bishop at another church in the same village, so it was quite an exciting day. More shuttles and a few hook holders (as seen in the giveaway) have travelled to Jane's home and she will be announcing their arrival into her shop soon. Perhaps you can see that they are even more streamlined than before. We are all waiting for the garage to get a little warmer, so that more shuttles can be made! To celebrate I am giving away this silk draw-string bag, a new hook holder and a dove. The hook size is 0.4 and the wood is cocobola rosewood. I did not make the bag or the embellishment but did add the tatting. The dove has been cut from a plinth that was underneath an altar and is made from English oak, the plinth had been in the church for well over 100 years old until it was removed recently. All you have to do is express your wish to win the give-away by making a comment. You have until Saturday 17th March (St. Patrick's Day) and I will announce the winner on Sunday 18th March after using a Random Number Generator, so please come back then to see who has one, it could be you! 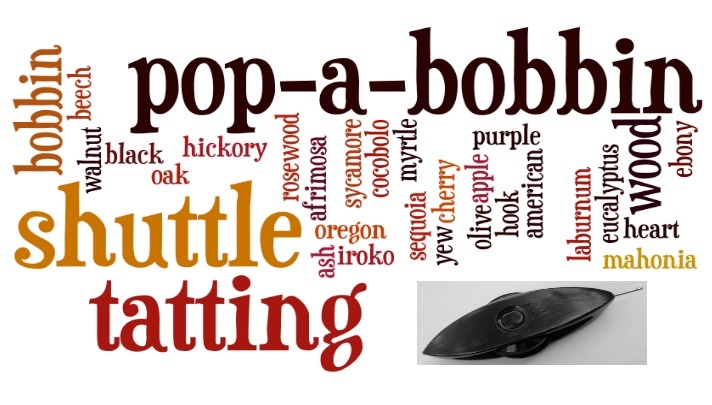 There will soon be some pop-a-bobbin shuttles for sale plus hook holders, and I will take a photograph of the new shuttles as the design has been refined again. Meanwhile I wish you the luck of the Irish! Thank you to all who have entered this giveaway, I just wanted to clarify that it is open to everyone regardless of where they live. I am prepared to post to all corners of the world! Well that is as long as I have an address! This is my 199th post and to celebrate my 200th there will be a "giveaway", so do come back then, to see what it is. I started a blog in April 2009 and have averaged just over 60 posts a year. This does not seem many especially compared to some people who obviously have a lot more time and energy than I do, but at least I am consistent! 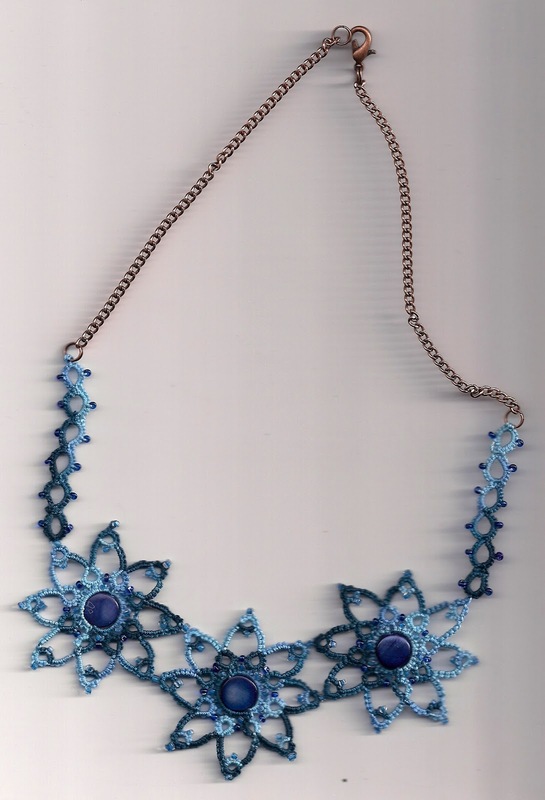 My latest tatting project has been these necklaces. 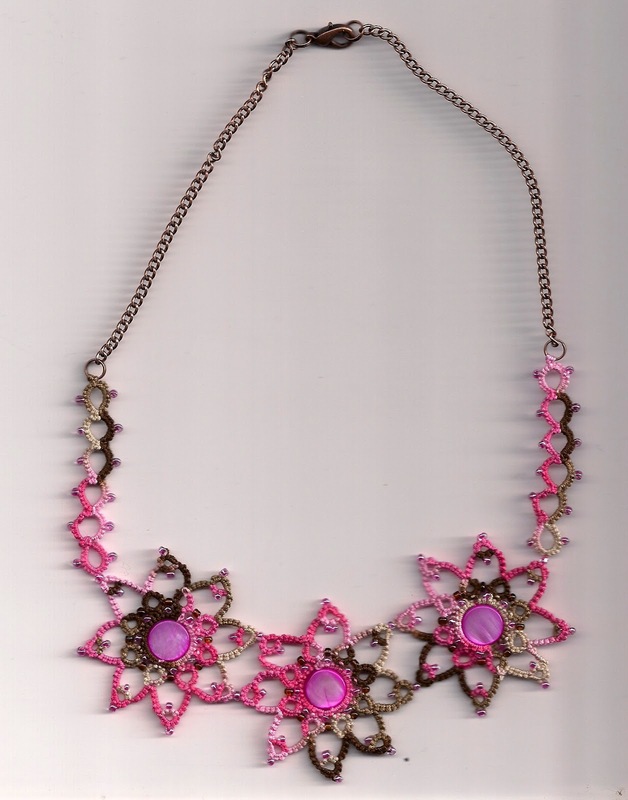 Looking at Jane's star motif which is here, it just shouted out to be turned into a necklace. The left hand one is made with the Lizbeth thread that Jane choose the colour combination for, Pink Cocoa. 'Im in the garage has had a nasty cold which he then passed on to me. Because of this shuttle production grounded to a halt for awhile. However, he is now back in the garage and is about to start the hook holders. He is going to make a few single ones and is also planning to make some double ended ones. The only problem is that he doesn't know what sizes the two hooks should be on each end of the double ones. What sizes are preferred for these? Any help will be much appreciated with this problem!